Understanding the needs of electricians, C.K Magma has enhanced its already popular range of premium tool storage with the new C.K Magma Test Equipment Case – an industry first, allowing electricians to carry diagnostic testing equipment and a selection of essential tools in one handy case. Historically, storage and transportation cases for test meters did not accommodate the additional toolkit also necessary for technicians to carry out diagnostic and final certification testing. Until now, there has been no universal solution on the market for storing and transporting both test meters and toolkits. After conducting extensive research into how electricians store and transport test equipment, C.K Magma noticed this gap in the market, developing the C.K Magma Test Equipment Case as a convenient solution to the problem. The new product is the first of its kind to feature made-to-measure storage for both a test meter and toolkit, removing the inconvenience of having to transport them separately. The case, with an RRP of £59.57, also offers a more lightweight alternative to carrying equipment compared to the heavier plastic cases often provided by the equipment manufacturers. Featuring rubber feet and adjustable padded compartments, the C.K Magma Test Equipment Case provides durable, safe storage for testing equipment, plus a separate top compartment for storing a range of tools and accessories. 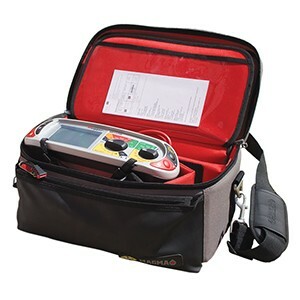 27 easily accessible pockets, including a handy business card and documentation holder, mean technicians can now carry all the necessary tools and documents for diagnostic testing without the need for any separate boxes, cases or bags. Recognising the need to keep such expensive equipment safe and secure, C.K Magma has fitted a lockable zip system to the case. With comfort as well as convenience and security in mind, a carry handle and padded shoulder strap have also been added to provide maximum comfort during transportation and use. The shoulder strap allows technicians to carry out equipment testing whilst carrying the case, making the process much more efficient. A product demonstration video is available to download via YouTube and Vimeo. Watch out for Freebie Friday competitions on Facebook and Twitter.